Thanks to the Voyager and Galileo probes, we’ve discovered that Io – the strange, colorful moon of Jupiter – is the most geologically active place in our solar system (including Earth as well), with scientists having identified some 400 volcanoes lighting up the surface so far. Now, the Gemini Observatory in Hawaii has released extraordinary images that show massive volcanic “explosions” taking place on this small moon. This certainly isn’t the first time we’ve captured an event like this unfolding (over the years, we’ve even had the pleasure of seeing a few minor eruptions up-close). Still yet, this specific event and the events that preceded it, all of which went down in 2013, might be something we remember about Io for generations to come. The first of the two notable eruptions leading up to the finale was witnessed in the southern hemisphere on August 15th, 2013. Imke de Pater — the University of California, Berkeley (UCB) scientist credited with its discovery — employed the use of the near-infrared camera integrated into the Keck II telescope, located on the grounds of the Keck Observatory in Hawaii. When looking at the region, he spotted a huge infrared fireball surrounding one of Io’s most well know calderas (regions that are generally associated with volcanic activity), dubbed Rarog Patera. As impressive as the first eruption was, the second one was even better. This time taking place in the Heno Patera caldera, it led to lava covering more than 120 square miles (310 square kilometers) of surface area. Then, not long after, on August 29th, 2013, while viewing the region using tools on two different Earth-based observatories, the third and brightest eruption took place; one so bright, it tops any and all eruptions ever seen on Io, yet its brightness is eclipsed by something even more spectacular, its power. Researchers went n to calculate that this outburst was over 10,000 times more powerful than the 2010 eruption of Eyjafjallajokull, a volcano in Iceland. Though there were no direct human casualties, the eruption resulted in the displacement of over 800 locals (It also shut down all air traffic coming and going through the region for almost a week, with some air traffic issues persisting for over a month). Only, unlike geological activity on Earth (in the past or present), the process isn’t driven by a combination of plate tectonics and other phenomena going on within Earth’s core. 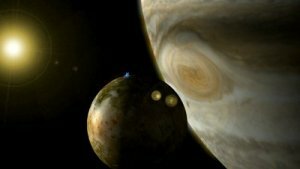 Rather, Io’s volcanism is largely the result of tidal stresses happening between the moon, its gargantuan parent planet and its 3 sibling satellites (Europa, Ganymede and Callisto, making up the four Galilean moons). However, it’s strange that the other moons are not active internally as far as we can tell (perhaps Europa excluded)it hasn’t been proven definitively either way), something else must be brewing beneath the surface (though, to be fair, given the fact that Io is the innermost Galilean moon, it definitely feels the effects of tidal stresses more powerfully than the others). Moreover, astronomers know to be on the lookout for at least one huge eruption every year or so. That, to this team, was a good reason to keep a close eye on Io when the warning signs became apparent. “These new events are in a relatively rare class of eruptions on Io because of their size and astonishingly high thermal emission,’ Davies said. This would indicate that the three eruptions could likely be the result of'”curtains of fire,” which occur when magma emerges through fissures within the surface, usually at an exceptionally quick rate. In Io’s case, some of them could several miles long. And even that has nothing on Loki — the most powerful volcano, not just on Io, but in our solar system in general. Moving forward, “We are using Io as a volcanic laboratory, where we can look back into the past of the terrestrial planets to get a better understanding of how these large eruptions took place, and how fast and how long they lasted,” Davies said. Io might have the most volcanoes of any object in our solar system, but it doesn’t have the largest one. That honor goes to Olympus Mons on Mars. Also, see what happens when lava is exposed to ice here.